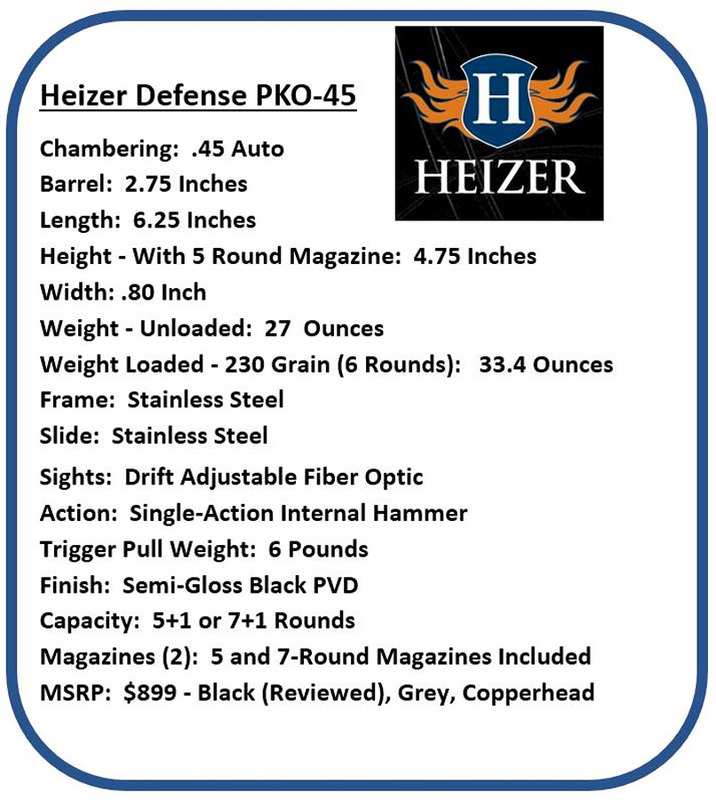 The Heizer Defense PKO-45 is currently shipping through select distributors and has a MSRP of $899. Current street prices range between $680 to $899. Walking the show floor at the 2018 NRA Annual Meeting, I made a conscious effort to stop by and spend some time with the folks in the Heizer Defense booth. As a firearm manufacturer, Heizer Defense has a unique backstory. Heizer Defense is a subsidiary of Heizer Aerospace, which has a long history of producing parts for the aerospace industry. They also have keen understandings of metallurgy, design, and production that they have leveraged in their Heizer Defense subsidiary. 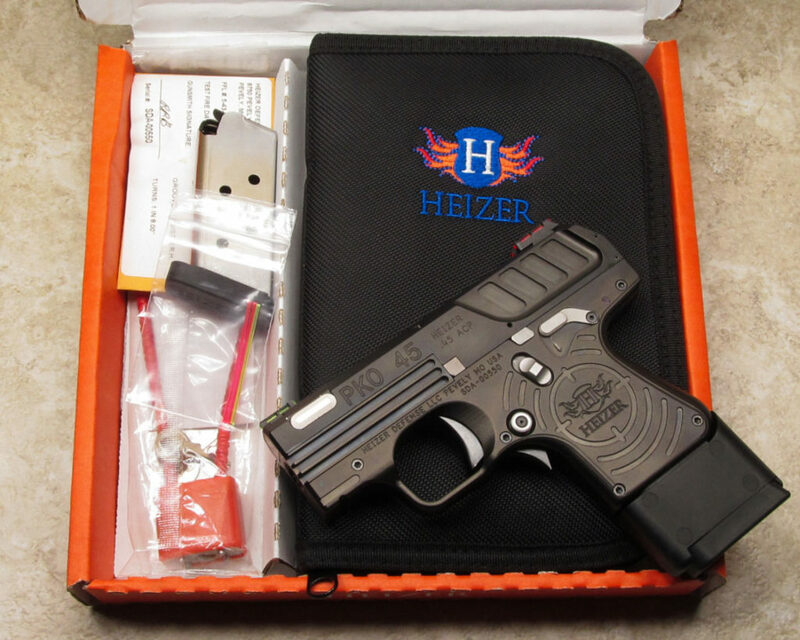 In 2013, Heizer Defense produced their first handgun. It is a single-shot .410/45 Colt chambered break barrel they call the PS1 Pocket Shotgun. Heizer added the single-shot Pocket AR in .223 Remington and Pocket AK 7.62 x 39mm pistols later on. All Heizer handguns are made in their Pevely, Missouri production facility. Now humor me for a second, please. If you have a nickel, hold it up by the edges and take a look at Thomas Jefferson. Now imagine a semi-auto handgun, chambered in 45 Auto, that’s less than the diameter of that nickel. That’s the Heizer PKO-45. I’d seen pictures of the PKO-45 prior to attending the NRA Annual Meeting, but I really needed to get my hands on one of the display samples to fully appreciate how slim it really is. As a frequent practitioner of IWB carry of single-stack 45 Auto handguns, a review was quickly arranged. Studying the review pistol when it arrived, I had to admit the PKO-45 was a unique-looking handgun. It retains many of the familiar features of a 1911 pattern semi-auto pistol while introducing some significant changes that make it as unique in design as it is in the way it looks. Eschewing plastic, except for the magazine base plates, the all-metal PKO-45 has a satisfying heft in your hand. Designed for concealed carry, all the sharp edges on the pistol have been radiused and smoothed for carry comfort and snag-free drawing from concealment. I generally avoid comparison pictures, but in this case, I realize many will be seeing the PKO-45 for the first time so a general size comparison is necessary. 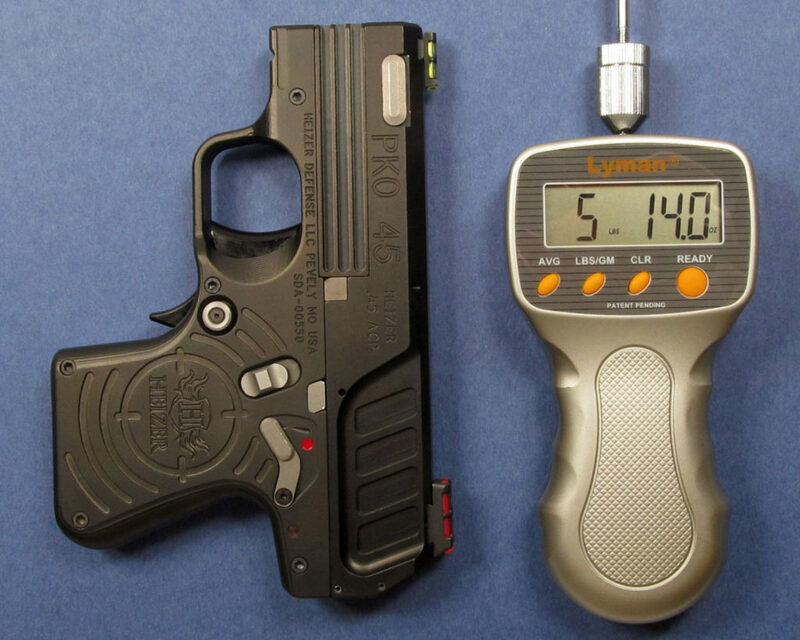 The PKO-45 is roughly the same size as a 3” 1911, but is significantly slimmer in width. 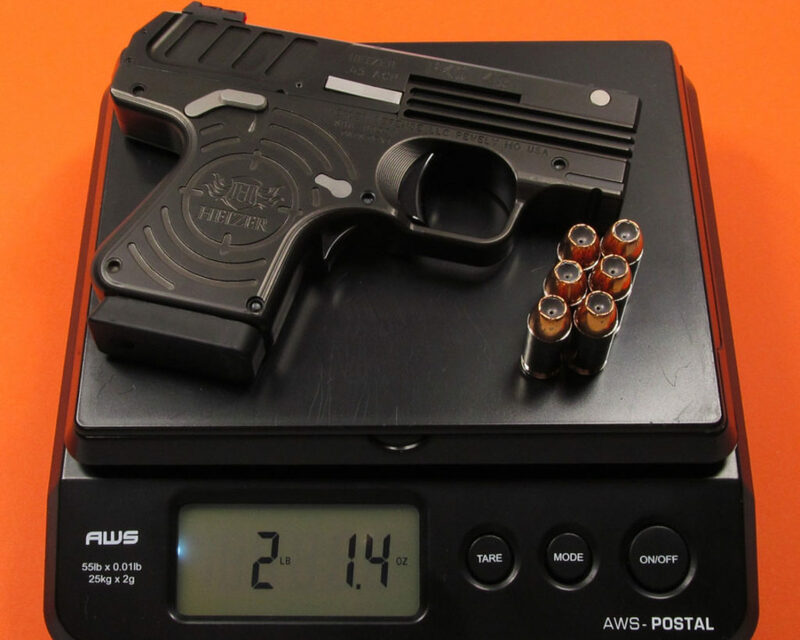 The PKO-45 is about the same size and capacity as a 3 inch-barreled 1911 pattern 45 Auto handgun. Inset photo shows the difference in slide width between the two. The PKO-45 slide, frame, and barrel are all machined from what Heizer calls Aerospace Stainless Steel. The grip frame of the handgun is machined as two matching halves that are joined together with five screws. The 2.75-inch barrel is pinned into the grip frame as the two frame halves are assembled. The machining, and subsequent fit of the grip halves, is exquisite. You can visually see the seam where the two halves meet, but you can’t feel it. The entire pistol has a black PVD finish that looks great with the contrasting stainless steel controls and take-down pin. 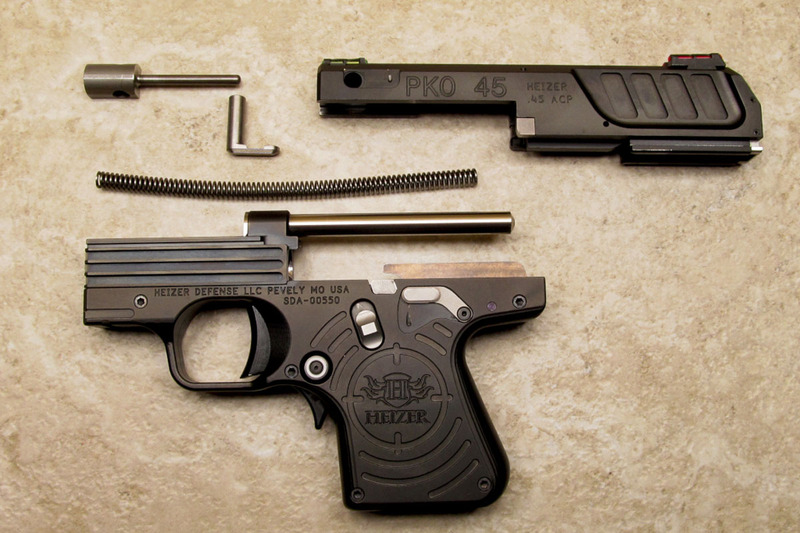 Attaching the barrel to the grip frame makes the PKO-45 a blowback-operated handgun. Blowback operated handguns are quite common in calibers ranging from .22LR through 380 Auto. Much less so in 45 Auto. Heizer positions a long hollow stainless steel tube directly above the barrel. This tube extends to the rear of the frame and acts as a recoil spring retaining sleeve for the slender recoil spring that operates the slide during the firing and loading sequence. With only spring pressure holding the slide closed during firing, you might expect the recoil spring to be quite stout. It’s actually not that bad and should be easy to operate for those comfortable with manually cycling full-sized semi-auto handguns. Fieldstripping the PKO-45 requires no tools. The takedown pin, near the muzzle on the left side of the slide, rotates 90 degrees to release the recoil spring and guild rod. The slide can then be removed from the rear of the frame. The PKO-45 is a hammer-fired single-action handgun. The hammer is located internally within the frame and slide. The trigger is medium-width and has a smooth face. The trigger has a small amount of take-up and breaks very cleanly at about six pounds of pull. I found the trigger to be unexpectedly good and a significant enhancement to overall shooting performance when the PKO-45 eventually made it out to the range. All controls are located on the left side of the frame and favor the right-handed shooter. The exception to this is the frame-mounted manual safety lever which is ambidextrous. All controls operate easily and fall within easy reach of the operator’s thumb. 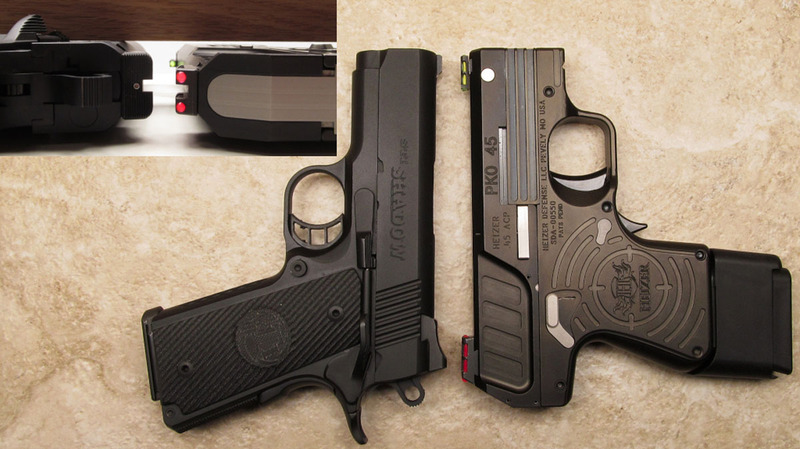 Additionally, a grip safety is located on the front strap of the grip directly below the trigger guard. The grip safety blocks the trigger from moving to the rear until the grip safety is deactivated by gripping the handgun. Field stripping the PKO-45 is a breeze. Remove the magazine and cycle the side to verify the hammer is cocked and chamber is empty. With the slide in the forward position, rotate the take-down pin above the muzzle 90 degrees. Hold your thumb over the recoil spring guide rod and remove the take-down pin from the slide. The recoil spring guide rod and spring can be pulled from the muzzle end. The slide is removed by pushing it back to the rear of the frame. Reassemble in reverse sequence. Wonderfully simple and easy. With the 5-round magazine in place, the author found it was possible to get most of his pinkie on the grip of the pistol avoiding having to wrap it under the magazine. 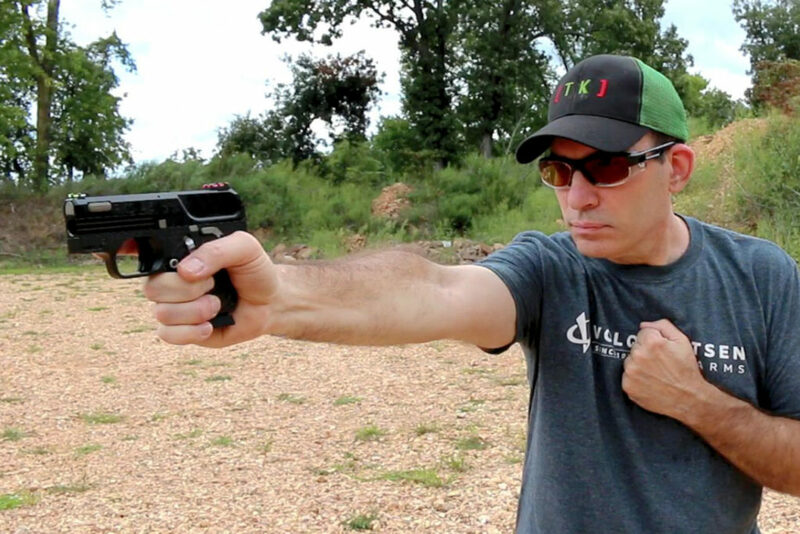 Heizer suggests a 200-round break-in period for PKO pistols. It’s in the manual with no other details provided as to why it’s needed, or what to expect, during the break-in period. Anticipating some break-in issues, I headed out the range with several hundred rounds of ammunition expecting to hammer my way through the break-in period as fast as possible. Squaring off on a target set at 7 yards, I found the fiber optic sights were regulated to point of aim using 230-grain ammunition. The pistol cycled smoothly with most brass ejected two paces forward and three paces to my right. Through several series of strong hand, weak hand, and two-handed strings of fire, the PKO-45 performed as expected. I used both the 7-round extended and 5-round flush fit magazines, ultimately deciding I liked the feel of the pistol better with the 5-round magazine. The 5-round magazine locked into place easily. The 7-round magazine needed a little more persuasion to lock into place. Just a little bump on the base was necessary to seat the magazine. I was pleasantly surprised by the accuracy of the PKO-45. It didn’t take long before I was sending my shots into the shot-out center of my first target. Setting up a second target at 10 yards I repeated my cycle of strong, weak, and two-hand shooting with very little change in the size of my groups. Having a short pull trigger with a nice crisp break was certainly helping my shooting. My initial concerns about accidentally bumping the manual thumb safety under recoil, or losing contact with the grip safety were unfounded. Both controls operated as expected. Try to remember back to when you were a little kid and made your first visit to an all-you-can-eat buffet. If you were like me, you were probably pretty miserable by the time you made your third trip to the dessert station. That’s about how my first trip to the range went. I had great intentions of getting through the entire 200 round break-in period, but my right hand was pretty miserable by the time I got through the first 100 rounds. Thin – Virtue or Vice? Now, remember the PKO-45 is less than an inch wide at the grip. That’s great for ease of concealed carry, but not much fun during extended range sessions. The area of your palm that comes in direct contact with the upper curve of the backstrap takes most of the recoil force as it’s positioned almost directly behind the barrel. Limiting your practice sessions to 50 rounds, or wearing a shooting glove will greatly enhance your enjoyment of the PKO-45. 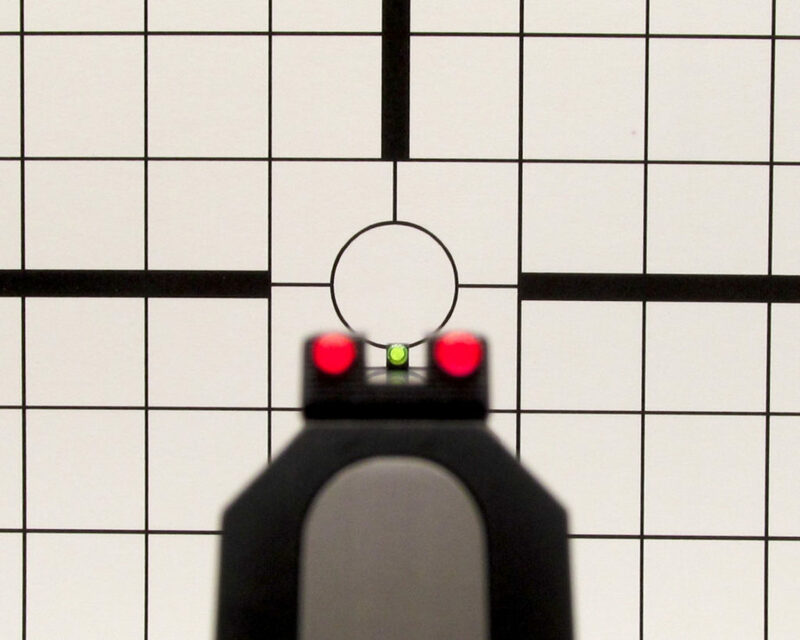 Shooting at distances of 7 to 10 yards using strong hand only, weak hand only, and two hands, the author found it easy to put good groups on the targets. Operationally, the PKO-45 was a great performer. Over the four trips I made to the range with the pistol, I had a single failure to eject and some early strings of fire when the slide did not lock back after the last round was fired. Neither of these conditions persisted after the initial 200 round break-in period. Final round count is a bit fuzzy due to my gregarious nature and willingness to let a few other range visitors have a turn with the PKO-45. I feel confident it was between 350 and 375. 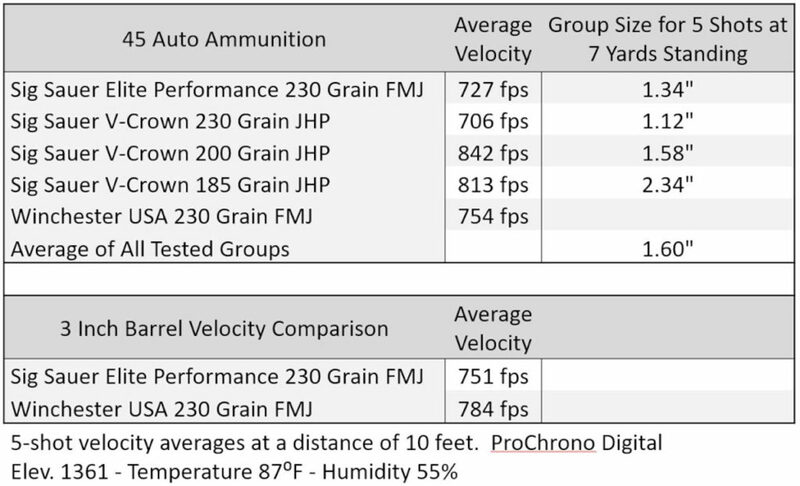 During the course of the review, I also wanted to see how much velocity would be lost with the 2.75-inch Heizer barrel versus a 3-inch barrel. A good rule of thumb is velocity will drop 100 feet per second for every inch of barrel length reduction. If the rule held, the velocity from the PKO-45 would be 25 feet per second slower than the 3-inch comparison barrel. Actual results in my very limited comparison test showed the difference was right on expectation at 27 feet per second. When comparing the 2.75-inch barrel of the PKO-45 versus the 3-inch 1911, velocities were expected to be about 25 feet per second slower. Our limited test sample validated this expectation. 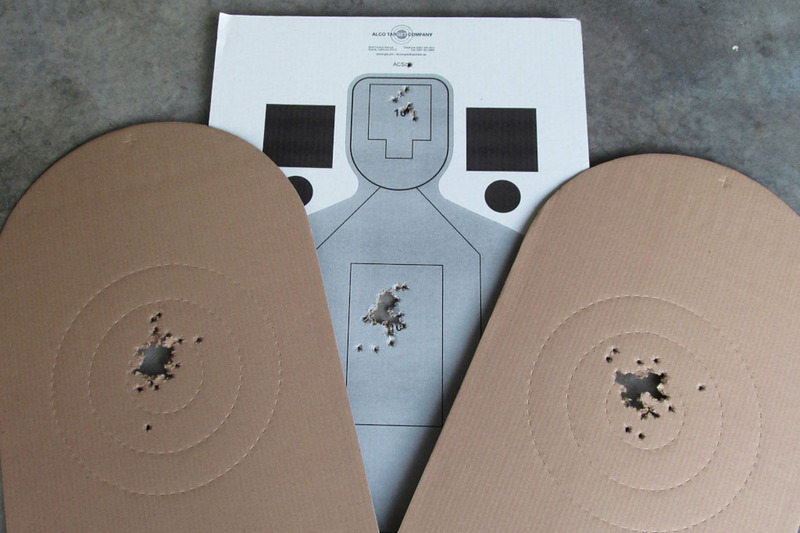 Another general observation from the range was that felt recoil was reduced when bullet weights decreased. 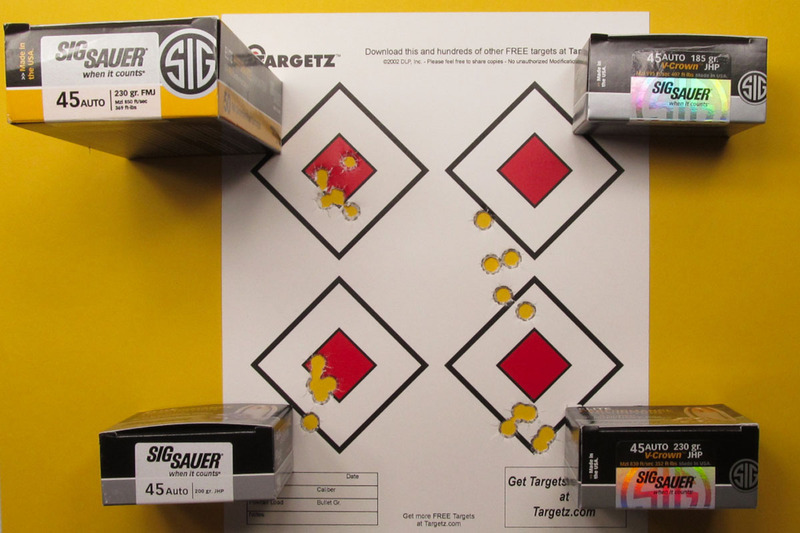 Sig-Sauer Ammunition is available in three different bullet weights in 45 Auto. Each load was tested for velocity, accuracy, and felt recoil. My personal preference was the 200 grain loading. It delivered the best balance of velocity, accuracy, and felt recoil. Off-hand accuracy was very good. At 7 yards groups were well regulated and pleasingly small. Accuracy was best with heavier grain weight bullets. 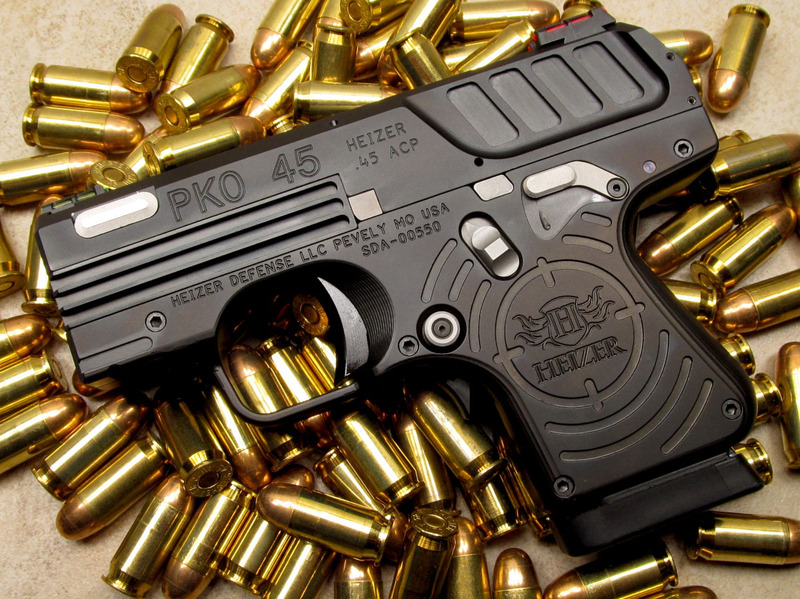 Heizer feels confident they have a winner with their PKO-45 design. Tapping into their expertise with metals, they expect to release a titanium-framed PKO-45 (MSRP $1099) that will reduce the current weight of the pistol by 4 ounces. An aluminum-framed PKO pistol in 9mm is also in development and should be ready for viewing at the NASGW Expo next month. The aluminum-framed 9mm will be 6 ounces lighter than the PKO-45 and launch with a MSRP of $699. Gosh, I’m impressed. 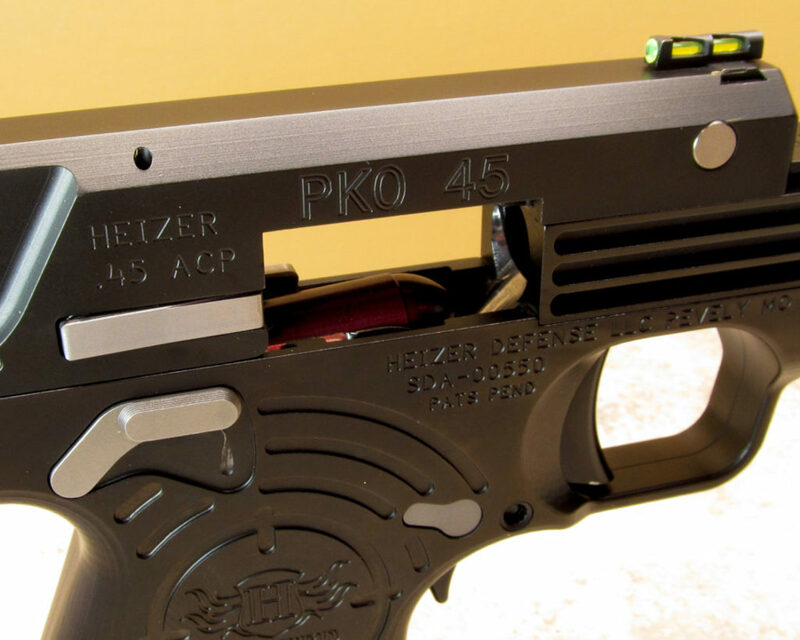 Heizer Defense made a huge transition from single-shot pistol maker to semi-auto firearm manufacturer with the introduction of the PKO-45. Not only that, but they did it by forging their own path and bringing us something totally unique in the marketplace. The ultra-slim profile, reliability, and accuracy make the PKO-45 a solid choice for concealed carry. It may not be the most enjoyable handgun you own for protracted range sessions, but this might be one of those pistols that you end up shooting infrequently, but carrying often. 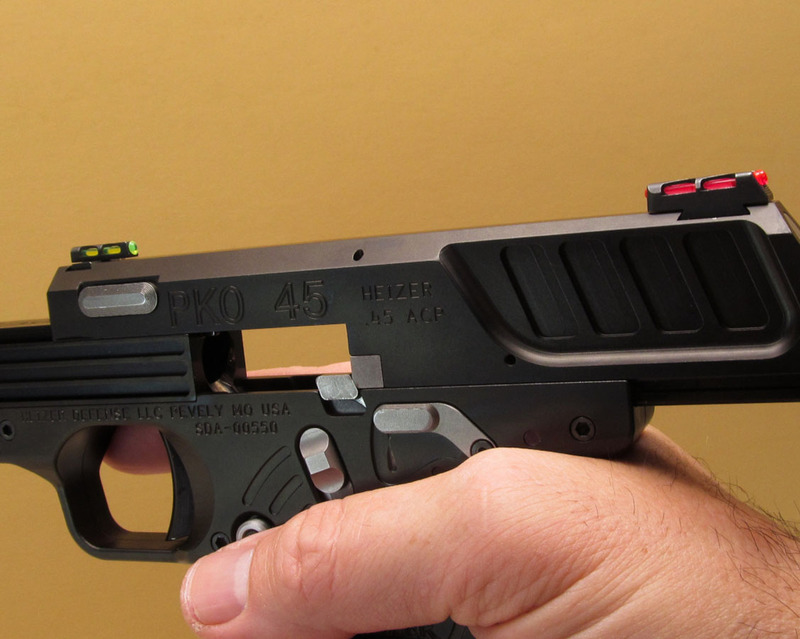 Heizer installs drift adjustable fiber optic sights on the PKO-45. Spare fiber optic rod is included with the pistol. Fully loaded, the PKO-45 is a bit heavy for pocket carry. You could carry it that way if you are comfortable carrying the weight equivalent of about 4 rolls of quarters in your front pocket. The PKO-45 trigger is exceptionally good with just a small amount of pre-travel before a crisp 6-pound break. For added safety, rounds can be chambered and extracted with the frame-mounted safety in the “ON” position. A grip safety is located directly under the trigger guard. Gripping the handgun deactivates the trigger-blocking safety. 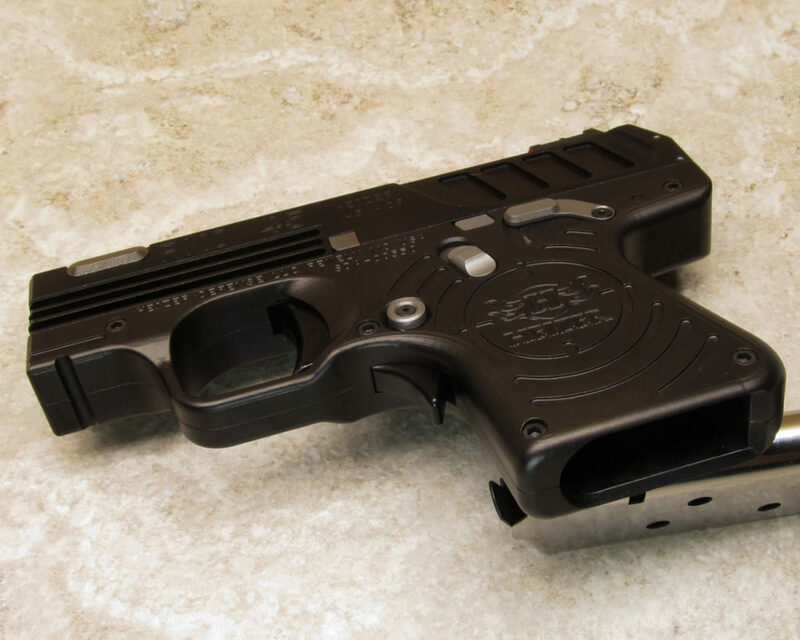 Deeply cut gripping surfaces on the slide provide secure purchase while also reducing the total weight of the handgun. The internal hammer is total enclosed by the frame and slide. 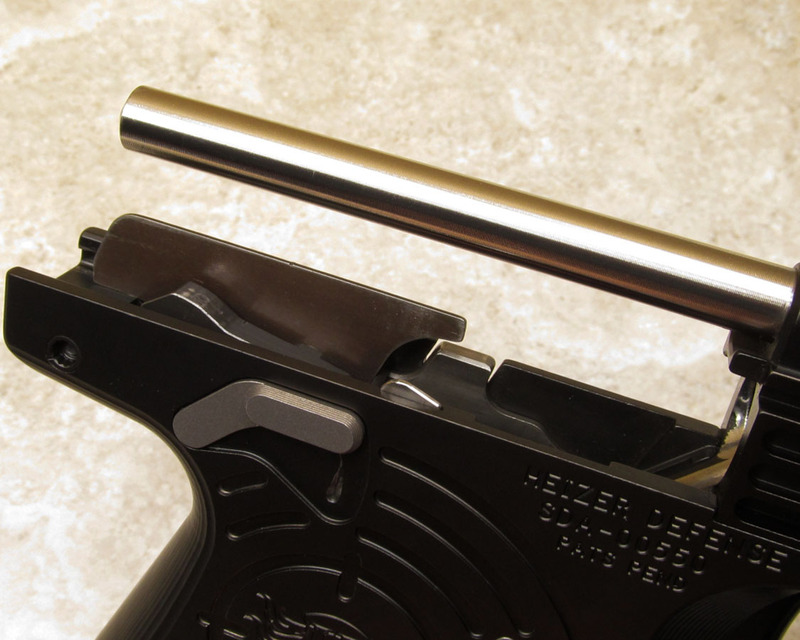 The stainless rod, above and behind the barrel, houses the recoil spring. All frame-mounted controls are within easy reach. The side rides high enough above the frame to eliminate the possibility of slide bite. Heizer steel magazines are proprietary to the handgun and are chrome plated inside and out. They also feature Check-Mate Industries patented followers for smooth and reliable feeding. 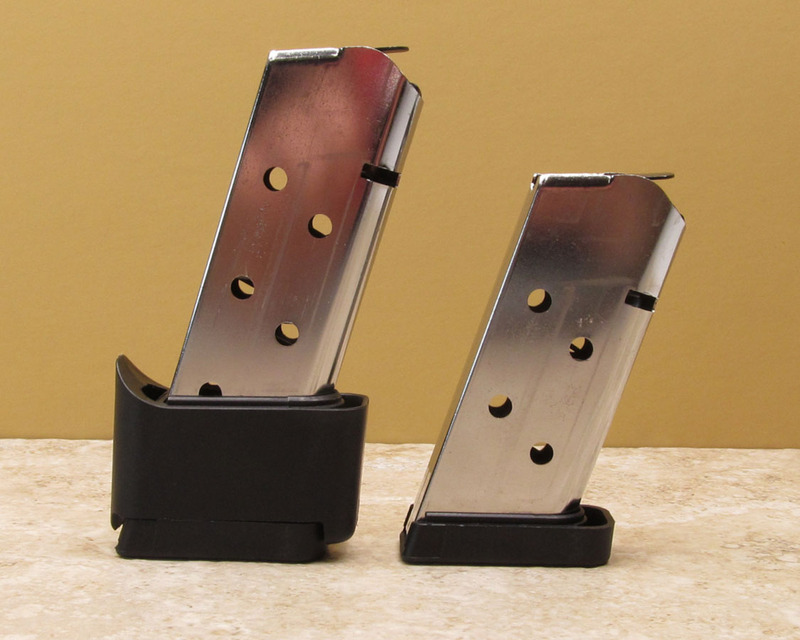 Spare magazines are available from Heizer for $33 (5-round) and $38 (7-round). The magazine well is lightly beveled to aid reloading. Heizer included a small rail section ahead of the trigger guard and is currently working with manufacturers to develop optional rail-mounted accessories to fill the rail. The PKO-45 package includes two magazines, all the usual goodies, spare fiber optic rod for the sights, and a Heizer-branded soft pistol rug. B11 – Holster selection is currently limited, but expected to improve soon. This Remora clipless holster worked well for the review. For more information, visit Heizer Defense. 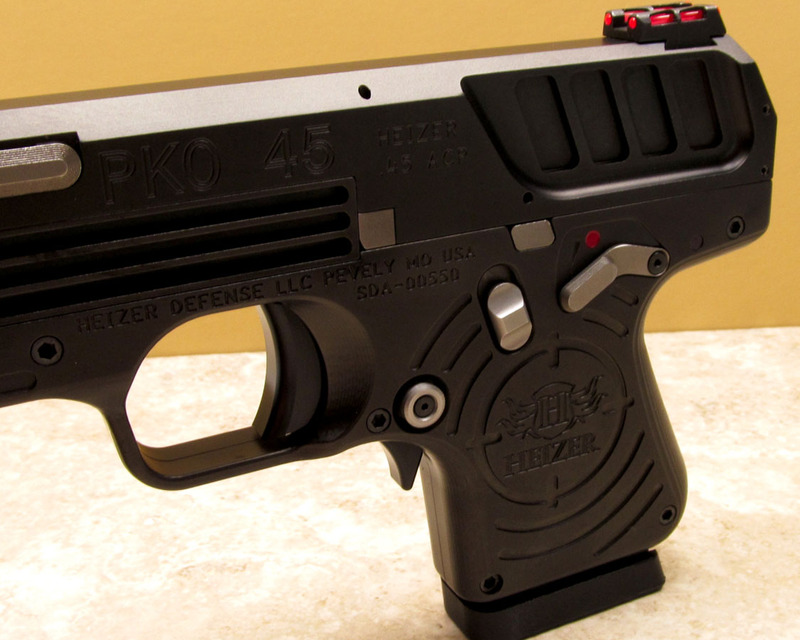 Heizer Defense PKO-45 – Thinnest 45 Semi-Auto Ever! Interesting, but no thanks. Price is high but that’s not most important factor for me anyways. Maybe I’m in the minority but weight matters to me with concealed carry more than how thin it is. Also the limited mag capacity is a negative to me. Don’t want to start a huge debate but I am personally Not a huge 1911 fan for same reason the weight and capacity. I do own several 1911’s but they are mostly limited edition safe queen collector items and are lovey guns. While it looks as though Heizer has recovered from the manic episode of marketing a series of single-shot handguns, an MSRP of $899 for a piece whose primary virtue is its thin profile is a real head-scratcher. There are better thin guns on the market for less money. Heizer’s corporate history as an aerospace contractor may explain the high ticket price of the PKO-45. Defense contractors instinctively choose to make $500 hammers. I like it but don’t need it. One size doesn’t fit all. It will do a fine job of protecting and pleasing some. It a very good article with excellent photographs. Thank you. Straight blow-back, fixed barrel designs are supposed to be more economical to manufacture. Hi Point, for example. The Heizer is made of better materials, but still, only steel, no expensive stuff like titanium or scandium. Making the frame “clamshell style”, in to halves joined together suggests they are punching them out on a press. In short, nothing to explain the high price, except maybe a small production run with a lot of R&D cost to recover. I’ll wait for the price to come down. Great ingenuity. However, I will stick to my XDs in 45. Love that thing. Got it used for three hundred and runs like a sowing machine. Easy to conceal. Way too pricey. My Springfield XDs .45 is very slightly larger, has been 100% reliable for years, is very accurate and is available for less than half the price. Every year the same thing. Heizer shows its 10 PKO’s, writers get all gushy, and product never appears. It’s lick clockwork. I count 7 currently available though the GunAmerica link at the bottom of the article. NOT IMPRESSED…. way too heavy. I have a .45 cal XDS that is also as heavy and slightly thicker. 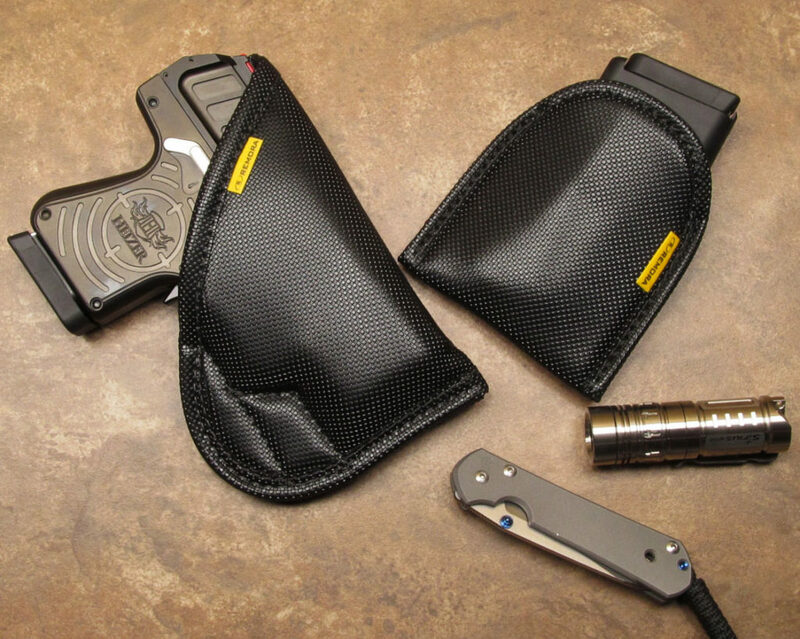 There are so many better, lighter and just as effective carry options for half the money. SORRY, BUT THUMBS DOWN. Solution to a non existent problem. Probably would own one by now if they were in stock anywhere..
Make it in a smaller caliber,smaller frame,lesser price and it may be the gun to carry for everyday.But at this size and caliber their are so many choices that are more friendly in size and price, which are just as reliable. I have all of Heizers quality pistols in my collection. A PRO 45 and Pocket AR .223 with a 7.62×39 and 410/45c barrels. Dont knock them unless you have one. $1000 (tax) is insane. I carry 2, 357 derringer and 45 backup. Both for that price. $899.00? Must be for the elite. Too many options that are WAY less and I have no trouble concealing a Glock 30 which you can get for around $400. So I can get two, carry one on each side and come out blazing like Neo in the Matrix. PLUS my UGLY Glock looks like a swan next to this thing. I didn’t think someone could make an uglier gun. Congratulations.! They win the gun Oscar for ugliest gun in the history of guns! And all for only $899! That should be a good reason to rob the cookie jar to get one so that you too can have the ugliest gun in the history of guns on your side.